i never would have thought it. 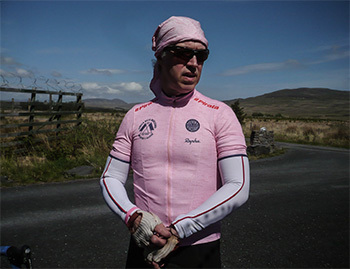 though i have often wondered how rapha ever manage to sell any winter or deep winter clothing on their own doorstep, the very idea of wearing a lightweight jersey this far northwest scarcely seemed credible. a visit to london these days is not a frequent occurence; it's ever so far away, and that distance seems to lengthen the older i get. i realise the latter is highly unlikely, but clambering off the sleepy bus at 7:15 in the morning is not something that bears frequent repetition, even though the journey has been travelled comfortably fast asleep. i'd agree that my finding the great metropolis uncomfortably warm - even in december - is more than likely the result of years of north atlantic acclimatisation, but surely no-one ever has need of fleece-lined bib tights and deep winter overshoes this far south? why, even yesterday, as i spent 70 kilometres in wind and pouring rain, london was experiencing sunshine and warmth. it is indeed, a travesty. sportwool has long been my friend, for not only does it retain its form factor longer than almost every polyester jersey i've ever owned, but owns similar properties to the force-fields seen on star trek and star wars. a long-sleeve sportwool jersey is much more my friend than it is anyone else's, especially if they live in the far south. or in one of those far off warm climates. and while we're discussing the latter, it is every bit a truism that the notion of a sportwool-less, lightweight cycle jersey (albeit with short sleeves) is a particularly apt choice for uncomfortable ambient temperatures. uncomfortable for me, that is. like it or not, i always found marco pantani to be an inspirational rider. yes, many of his exploits were fueled by substances that should not have been in his bathroom cabinet, but i (and more than a few others) were blissfully unaware of that at the time. our naivete allowed us to apprehend the diminutive italian's climbing prowess in a favourable light, aided greatly by the fact that his dancing on the pedals was a style i attempted in vain to emulate. this hero worship, however, stopped short of ordering a mercatone uno jersey and replica bandana, though my finger hovered over the add to basket button more than once without ever committing. rapha, la gazetta della sport notwithstanding, are arguably responsible for popularising the colour pink within a yellow obsessed pelotonese. the first ever rapha jersey purchased by yours truly bore the word mortirolo in flock lettering across the front of pink sportwool. i still have it and wear it; the lettering is still immaculate and the jersey looks as if it came out the packet just yesterday. and now there's another shade of pink to join it in the jersey drawer, albeit of a more modern composition. i confess i'd overlooked the fact that the pantani jersey was of lightweight constitution, perhaps fortunately because that would have led to apprehension and consternation while awaiting its delivery. though we're well into the month of may, warm sunny days are very few and far between; most of them tend to fall on workdays when i'm stuck in an office all day, though i'm sure that on such occasions, i can hear the colnago calling me all the way down main street. granted, it involves little hardship to conceal all that pink beneath a rainjacket or pro team jacket, but that is hardly the appropriate manner in which to honour marco. but if you promise not to tell anyone, the pantani jersey does indeed do itself proud as a mid-layer on a less than sultry day. those domiciled in the london area can safely ignore that last recommendation. 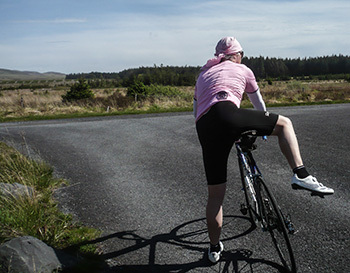 it'll be a few months before the atlantic warmth reaches the level of affording riding pleasure devoid of armwarmers. 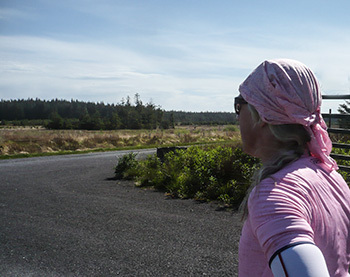 however, last friday offered a few kilometres without need of a pro team jacket, though the warming of a pair of red-striped armwarmers was still a necessary addition. for reasons i know not, full-length zips rarely seem to sit flat when new, but when safely ensconced in its zip garage, the medium-sized pantani jersey was an immaculate fit. 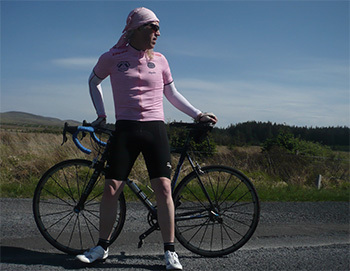 and it turns out that a rapha lightweight jersey bears a far more favourable constitution than i had led myself to believe. in similar manner to rapha's pro team jerseys, the fit is designed specifically for the bike, rather than in the queue for soya froth. i have always held it to be the finest compliment one can pay a jersey of any fabrication, that it is all but unnoticeable during a bike ride. that is fabulously true of this shade of pink. the fabric, polyester according to the label, had me convinced otherwise. the tactile, waffled surface makes it seem thicker than is actually the case; according to rapha, it's comfortable against the skin, but that's a factor i am unlikely ever to discover. baselayers 'r' us. the side panels are formed of mesh panels, and all takes mere minutes to dry after washing. the graphics are both appropriate and tastefully applied, with subtle graffiti augmenting a lighter pink. the pantani jersey does not, however, arrive alone. 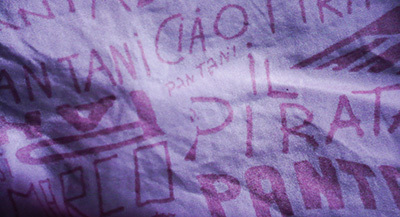 many pantani images feature the chap with bald head clothed in a mercatone uno bandana, and while my ever-lengthening hair bears no resemblance whatsoever, rapha have thoughfully added a pink cotton bandana, decorated with fans' graffiti. having never worn a bandana prior to now, i'd to find a how-to youtube video. it's a look i'm sure i could just about get away with; certainly more so than wearing it a la john wayne. all in all, it's a fabulous jersey, a great tribute to a troubled and fragile cyclist, whatever your personal views might be. if it bothers you that the clothing suppliers to team sky should see fit to honour an acknowledged drugs cheat, you may wish to read rapha ceo simon mottram's justifications for its existence. 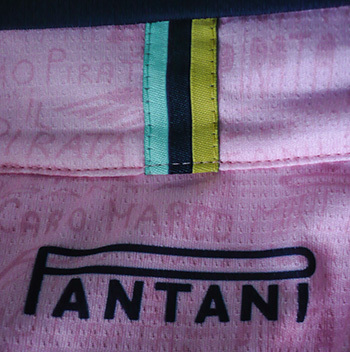 aside from being a particularly excellent cycle jersey with stregthened and scalloped rear pockets, a percentage of your £130 will go to the pantani foundation, a charity established by marco's mother to help disadvantaged children. however, my climbing abilities while wearing the jersey bear scant approximation to a slow-motion replay of marco riding alpe d'huez. i may have to have words with rapha about that. rapha's marco pantani commemorative jersey with bandana retails at £130 and is available in sizes extra small to xxl.